Several Greenville players ganged up to make this tackle during first-half action of the Troy-Greenville football game Friday night at Harmon Field. The Trojans defeated the Green Wave, 48-12. Greenville running back Di’Maurye Ewing (7) looks to find a way through the line during first-half action of the Troy-Greenville football game Friday night at Harmon Field. The Trojans defeated the Green Wave, 48-12. Greenville’s Marcus Wood (1) takes the screen pass from Tyler Beyke and gets outside for a short gain during first-half action of the Troy-Greenville football game Friday night at Harmon Field. The Trojans defeated the Green Wave, 48-12. 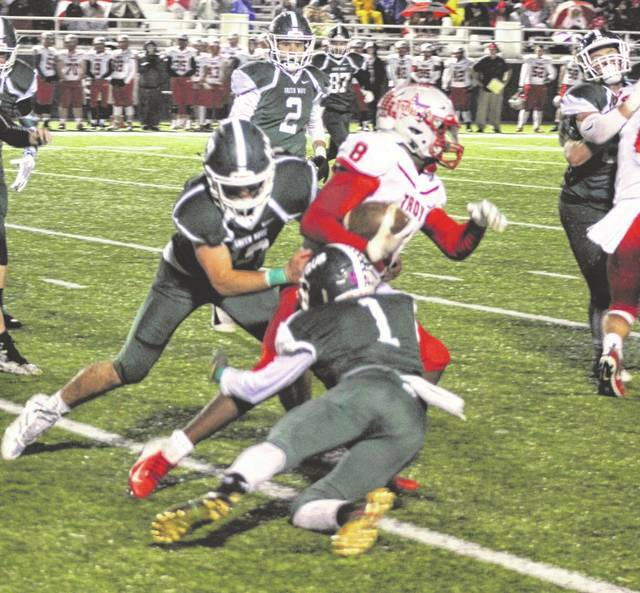 Greenville’s Marcus Wood (1) and Ethan Saylor (10) combine to bring down Troy running back Jaydon Culp-Bishop during first-half action of the Troy-Greenville football game Friday night at Harmon Field. 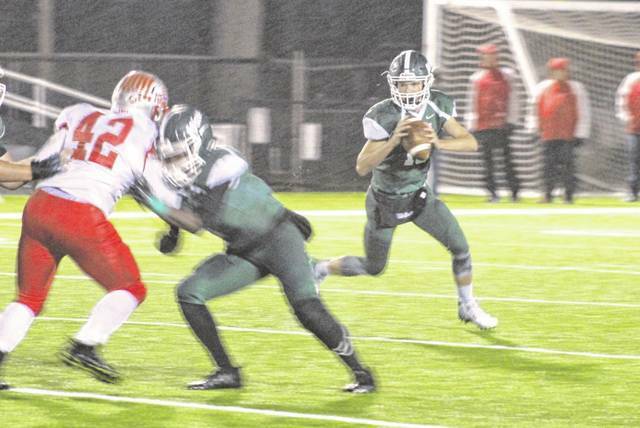 The Trojans defeated the Green Wave, 48-12. Greenville quarterback Tyler Beyke (18) rolls out looking for an open receiver but ends up pulling it in and running for a long gain during first-half action of the Troy-Greenville football game Friday night at Harmon Field. The Trojans defeated the Green Wave, 48-12. 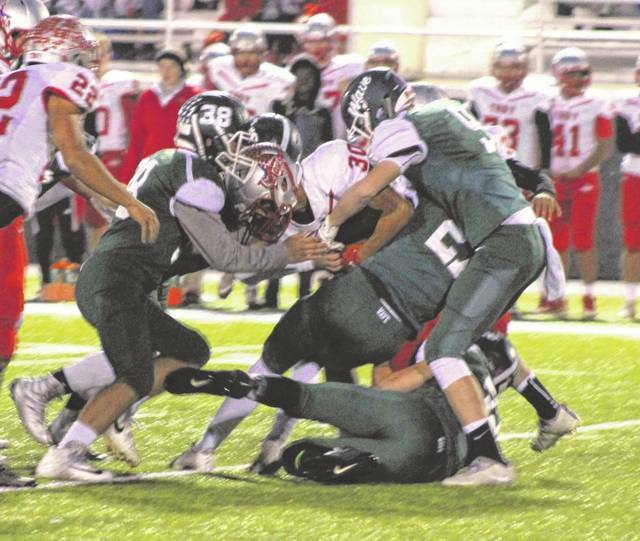 GREENVILLE – It may sound cliché, but it really was a tale of two halves at the Troy-Greenville football game on Friday night. The first half belonged to the home team which was celebrating its Senior night. 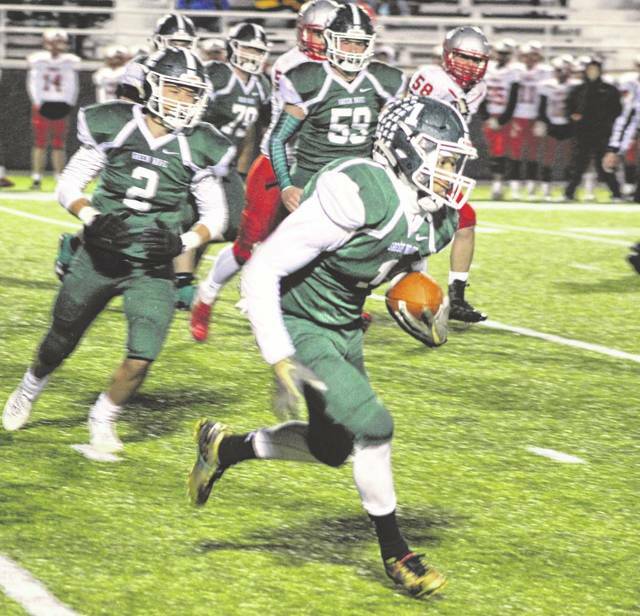 Despite trailing 20-12 at halftime, the Green Wave held their own against the playoff-bound Trojans scoring the first points of the game and then embarking on a long drive that ended up in the end zone to close the first half. However, Troy has had a strong season with seven wins coming into the game. They made halftime adjustments and scored 28 unanswered points in the second half to cruise to a 48-12 win. It was Jaydon Culp-Bishop, a 5-foot-10, 183-pound senior running back, who did most of the damage for Troy. He bruised and battered the Wave’s defense for 399 yards and six touchdowns on just 28 carries (a 14.3 yards per carry average). Culp-Bishop is the rushing leader in yardage and touchdowns in the Greater Western Ohio Conference with 1,739 yards and 28 touchdowns through nine games. Greenville as a team only has 1,431 rushing yards and 19 touchdowns. “We came out in the third quarter and scored three touchdowns in the first seven minutes,” Troy coach Matt Burgbacher said. “That’s the team we expect to have and we have to do that for 48 minutes. Greenville came out and played hard and made a couple plays in the first half. We let a few things effect us and we just told them at halftime to settle down and relax and let’s just go after it and play Troy football and our kids did that in the third quarter. It was good, but we want to see that for 48 minutes. Marcus Wood handled the Greenville scoring on the night. He had a 50-yard catch and run in the first quarter that saw him break numerous tackles to give his team an early 6-0 lead. He also caught a 3-yarder from quarterback Tyler Beyke in the left corner of the end zone with 4 seconds left in the first half to pull Greenville within 8 points at halftime. Wood was Beyke’s favorite target on the night finishing the game with 8 receptions for 126 yards and the 2 TDs. Beyke completed 15-of-22 passes in all for 196 yards and two touchdowns. He also was intercepted twice, one each by Jacob Adams and Weston Smith. Greenville also intercepted Troy quarterback Brayden Siler and recovered two Trojans fumbles. 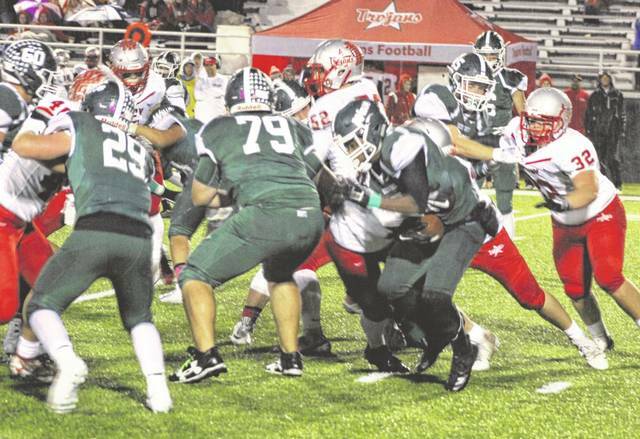 Jacob Goldsmith corralled the Green Wave interception late in the game and Terry Miller and Ethan Flanery each had a fumble recovery. The win unofficially clinched a playoff spot for Troy (8-1, 4-0 GWOC North), which currently ranks third in the Division II, Region 8 computer rankings. Greenville (3-6, 0-4 GWOC North) is ranked No. 22 unofficially in Division III, Region 12 and is mathematically eliminated from playoff contention. Next week is the last week of the regular season. Both teams will be on the road with Greenville at Sidney and Troy at Piqua. This entry was tagged Aaron Shaffer, Greenville Green Wave, Jaydon Culp-Bishop, Marcus Wood, Matt Burgbacher, Troy Trojans, Tyler Beyke. Bookmark the permalink.